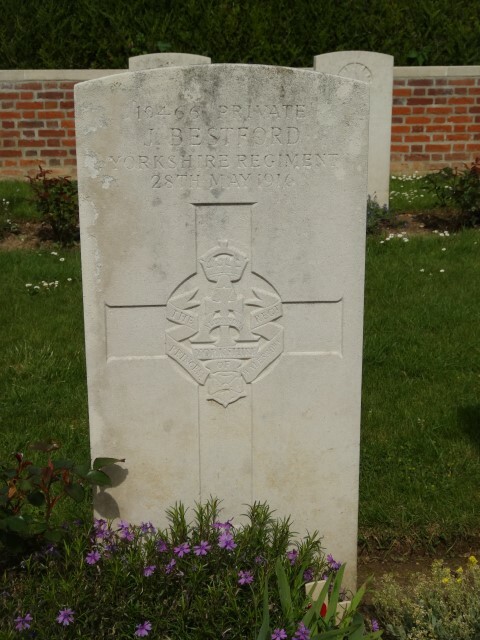 19466 Private John Bestford, 10th Battalion, the Yorkshire (Alexandra, Princes of Wales’ Own) Regiment was killed in action 28 May 1916 and is buried at Dartmoor Cemetery, Becordel-Becourt. He is commemorated on the West Auckland War Memorial and the Roll of Honour in the West Auckland Memorial Hall. 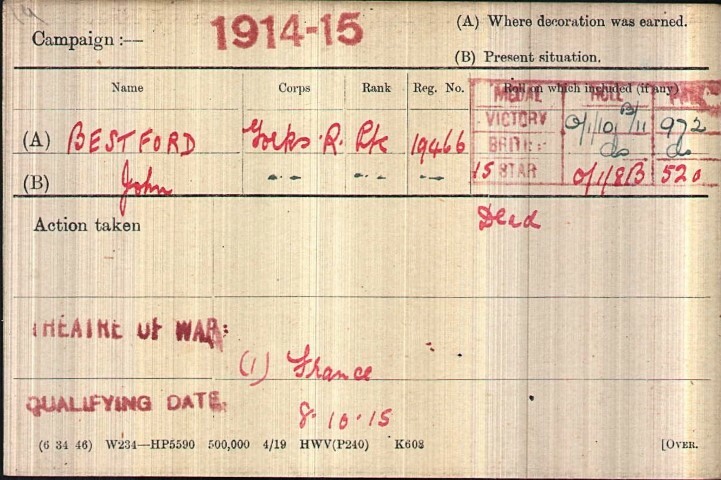 Private J. Bestford was 26 years old and the husband of Sarah. In 1901 the family lived at East View West Auckland where Robert worked as a coal miner (hewer). 19 year old Isabella was employed as a domestic servant. In 1911, the family lived at 11 East View and all the men including 21 year old John worked as coal miners. In 1912 John married Sarah A. Richardson. The service record of John Bestford has not been researched. 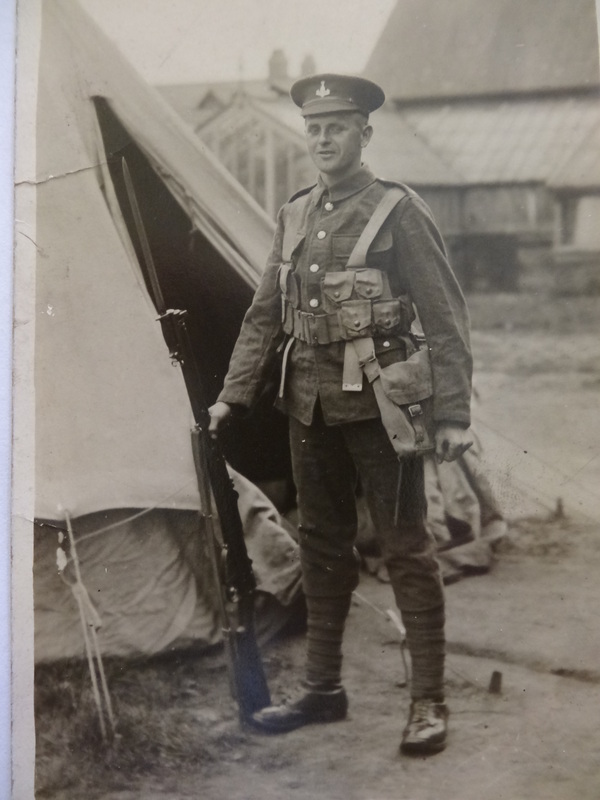 John enlisted at Bishop Auckland into 10th Battalion, the Yorkshire Regiment, commonly known as the Green Howards and was given the regimental number 19466. 17 April: the battalion arrived at billets at Ville-sous-Corbie being greeted by 14no.5.9 shells fired from the Fricourt area. There was intensive activity, new railways, new communication trenches, new roads and new gun positions during this period leading up to 1 July 1916. The circumstances of their death have not been researched but it is possible that they were subject to effective enemy artillery fire. Between 31 March and 1 June 1916, 10/YR lost 17 Other Ranks. “The Green Howards in the Great War 1914-1919” Colonel H.C. Wylly 1926 p.331 Note: the 10/YR War Diary has not been researched.